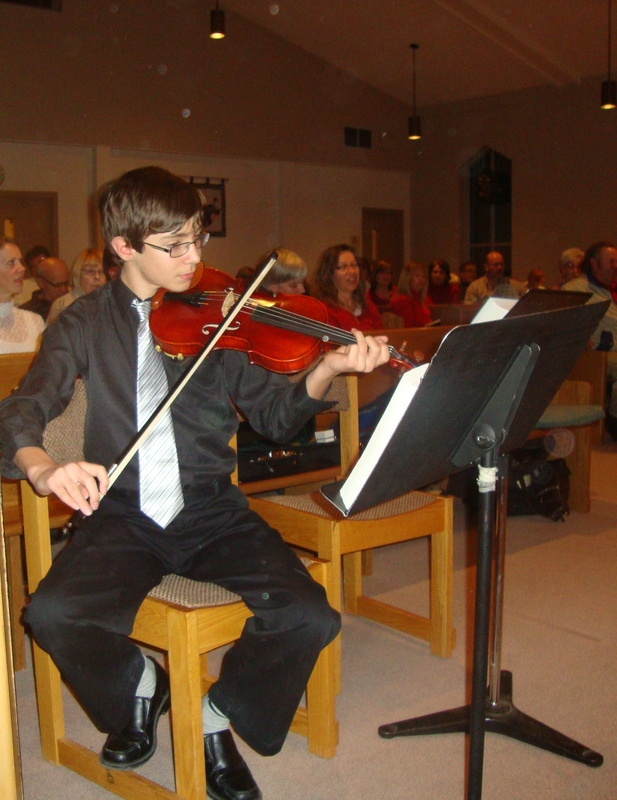 Ministers–especially those in congregations with little other staff–need volunteers to make ministry happen. Lots of them. At Trafalgar where I serve, people work alongside me to make sure that the building is clean and safe, the programs fun and helpful, the worship life-giving and beautiful. As much as I do the work of leading, preaching and offering pastoral care, we could not be a thriving community without many gifted people. Our community needs those with skills for cutting the grass, keeping financial records, making coffee and playing the violin. What’s more, we need gifted people who are also willing to share their time. I have been thinking about this even on my sabbatical because I am not only surrounded by volunteers at church; there are dozens of them in my garden, too. “Volunteers” is the name gardeners give to those plants that appear on their own. Usually they are the result of a plant that has managed to successfully reseed itself in a new location. Granted, sometimes the line between a volunteer and a weed is a fine one. But I love the thrill of discovering a tiny and unexpected surprise in the spring garden, a grace-filled moment when I realize I have been gifted with something I had no hand in planting. My volunteers seem awfully tenacious. 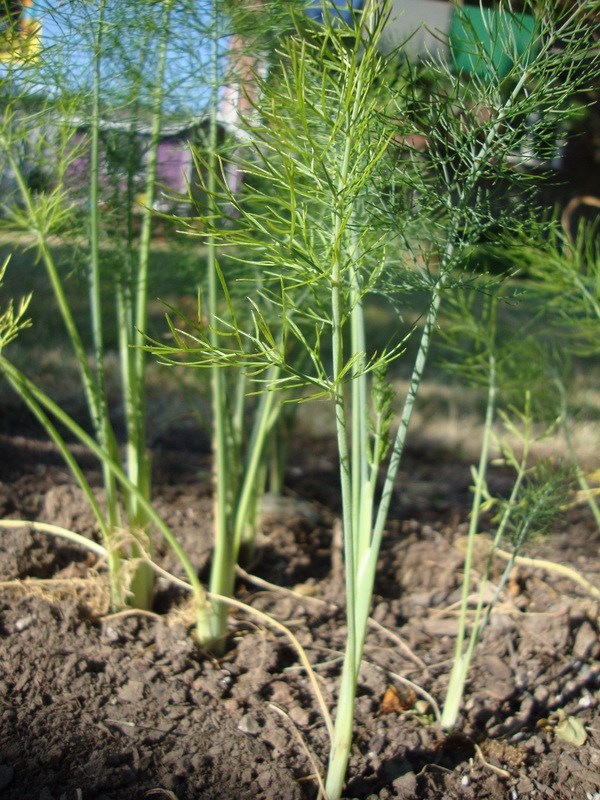 I planted Florence fennel a few years ago as an experiement. Unfortunately, I failed to do a very good job of mounding the soil up around the bottom of the plants, so the roots never really grew into tender, white bulbs. I wasn’t sure when to harvest them, either so left them in the ground too long. In the end, not only did they look awful with their tall, gangly stems running roughshod over any poor unsuspecting vegetable that happened to be nearby, but they were too tough and woody to eat. Silly me threw up my hands and let them have their way. They responded by happily going to seed. Every spring since then, hopeful green shoots taunt me with their delicate, ferny leaves and I can’t bear to tear them all out. I see those young fennel shoots and I appreciate their willingness and their determination. No matter how tough things get, they keep going. I know some people like that. Sometimes volunteers appear at just the right moment. Looking around the garden this week, I discovered that a squash of some sort has sprouted in the compost I used to mulch the broccoli. I thought this was probably a good good place for him to carry on, since the broccoli will be finished just as his large, beefy leaves begin to spread. 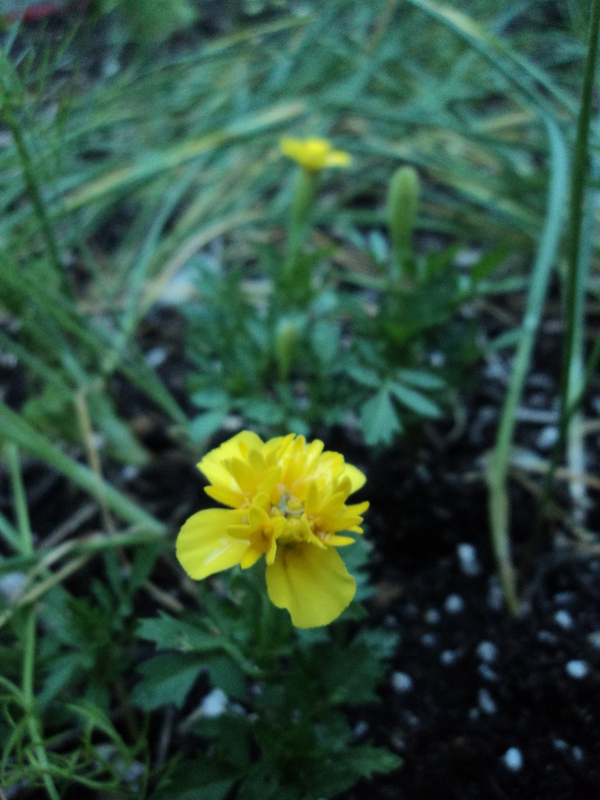 I also found some tiny yellow marigolds in the back vegetable bed which, thankfully, I recognized before ripping them out. They have added a nice bit of colour near the thyme and garlic, and without me lifting a finger. I love it when gifted people have the opportunity to contribute in the perfect way, making their life and the community richer, too. 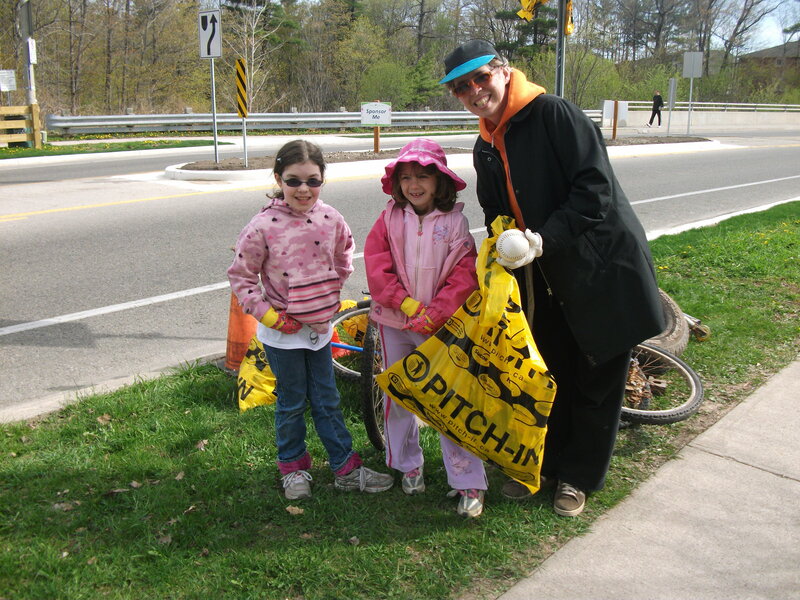 Sometimes volunteers are terrific–but not in the right place. I love the foamy yellow flowers of Lady’s mantle and their pretty, scalloped leaves. So I was thrilled when new ones showed up this spring, healthy and green. Unfortunately, if I had left them where they sprang up they would have been smothered by the nearby hosta and iris. But, as with many people willing to help, all it took was a gentle hand to transplant them into a new place. They bloomed like crazy after that. I have seen that with people, too. Someone might start out on the finance committee but end up being the most effective washing lettuce for a church supper! 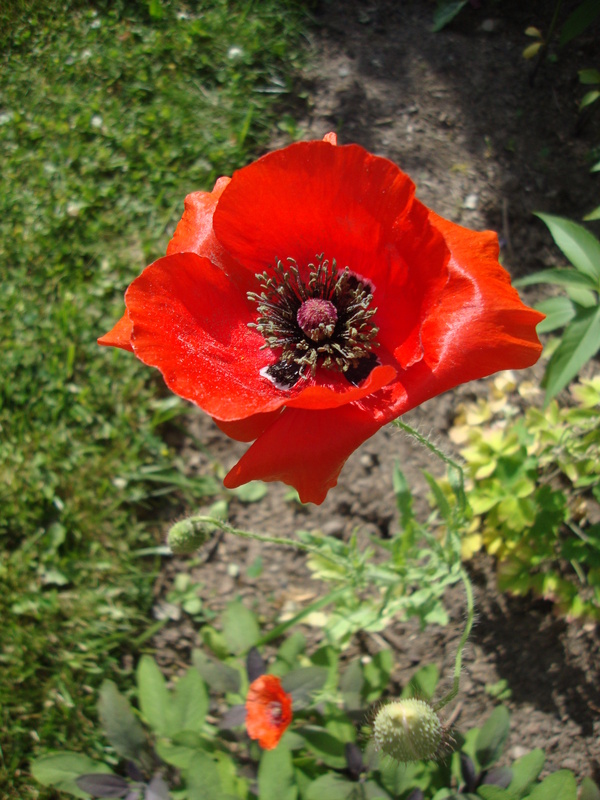 And then there are the volunteers that you wait for and pray for and hope for and they mysteriously appear–like the red poppies I discovered in my garden this year! The single sprout had looked like a rather strange and suspicious weed so I left it alone. It began to give small hints that perhaps it was the poppies I had been longing for, drooling over them in other people’s gardens. At dawn not long after, I went out to the side yard to find one solitary red flower. Hurray! The flower I have always wanted but never seemed to get around to planting! I have no idea how it got there, and I don’t much care. It is a perfect, beautiful volunteer and I am grateful to have it. Like the entire crew of people who showed up to serve at Donaghey Square when we were sure everyone would be on summer vacation. There is something amazing about garden volunteers. They are completely free–you don’t have to buy them and you don’t have to grow them. They are happy coincidences, undeserved gifts. I hear that North American culture is changing, and volunteers are harder and harder to find. Gone are the days when women stayed at home full time and had the extra time it takes to canvass for the Cancer Society or work the cash register at the hospital auxilliary. Gone are the days when it was common for men to join clubs like the Optimists and the Lion’s Club. The Boomers, Gen X-ers and those beyond are far less civic minded than their grandparents. We prefer to run or walk for breast cancer or give a few bucks at the office. Neither of which is the same thing as volunteering our time, energy, skills and leadership. So in a day and age when volunteers are scarce, and with my slightly crazy delight in my surprising red poppy, I am feeling grateful for all the people in my community who serve with me. Today I am thanking God for volunteers. This entry was posted in Uncategorized and tagged flowers, gratitude, life, Trafalgar. Bookmark the permalink.